Syria’s State media are trying to portray some value in Russia’s “peace” talks, which opened on Monday, claiming an “atmosphere of optimism” among the members of the domestic opposition who chose to attend. The leading domestic opposition groups and figures refused to go to Moscow, citing a lack of prospects for advance and demanding that the Assad regime free senior members who are detained. The regime has also backed away from the process, pushed by Russia since November, with President Assad saying that discussions would only be held with “individuals”, not groups. The regime has also snubbed the talks by sending a lower-level delegation, which only arrives in Russia on Wednesday. Foreign Minister Walid al-Moallem is staying home, with Syria’s UN Ambassador and a low-key Foreign Ministry advisor leading the Damascus team. However, State news SANA declared “efforts to try to find common ground” among the opposition. Like the Assad regime, it refuses to acknowledge any organized groups, instead quoting individual members. According to SANA, Sameer Hawash, a senior member of the al-Shaab Party — last significant in Syrian politics in the early 1960s — said dialogue is needed “so that we could arrive at a political solution in parallel to combating terrorism” and to close “very sharp” differences. SANA emphasizes Hawash’s statement of “the necessity to support the Syrian Arab Army in the face of terrorist organizations such as the Islamic State in Syria and Iraq and Jabhat al-Nusra”. 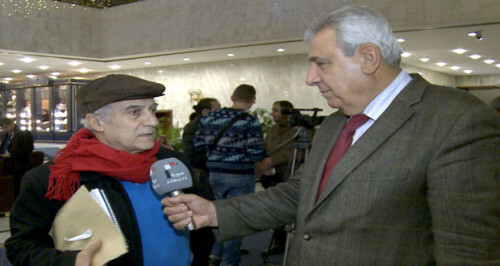 Fateh Jamous, a member of the Peaceful Change Path Movement — promoted by State media as part of the “Coalition of Peaceful Change Forces” — echoes the regime line “that the opposition parties who did not come to Moscow were seeking to abort the meetings”. The Secretary of the “National Coordination Committee for the Syrian Diaspora”, Majid Habbo, and members of the “Council of Tribes in Syria” are also cited. We welcome what is going to happen in Moscow and [related talks in] Cairo because any type of beginning of discussion among and between the Syrians is something we have to support. Will this produce a political [solution]? We will see. What we can certainly say is that we can’t afford to simply wait for it to continue like last year. The US and Turkish Governments have offered different reactions to Monday’s victory by Kurdish forces over the Islamic State in Kobane in northern Syria, near the Turkish border. We’ll continue to support them as we look to the coming weeks ahead. This is an important step in the first phase of a long-term campaign to degrade and ultimately defeat ISIL [the Islamic State], because of the strategic value ISIL places on Kobane. Now, they [Kurds] are dancing. What happened? ISIS was ousted from there. Okay. But who will repair the places that were bombarded? Who will repair those demolished places? No one thinks of the future. Will the 200,000 who left be able to return? When it is about Kobane, the whole world stands up and cooperates. Those who fled Kobane came to us — 200,000 people. We tell them about Aleppo, nobody listens; 1.2 million people live there. There is economy, history and culture (there). Why aren’t you interested? The Bab al-Hawa crossing in northwest Syria on the Turkish border will remain closed until Thursday following an armed confrontation on Monday between Turkish security forces and the insurgent faction Jaish al-Mujahideen. The clash reportedly occurred after a Turkish soldier strip-searched the wife of a Jaish al-Mujahideen fighter. Another Turkish soldier was wounded in the exchange of fire. Insurgents watch the Syrian military’s hilltop checkpoints in Daraa Province, south of Damascus. The opposition has made significant advances in the area in the past week, taking two regime bases and a series of villages. They claimed the capture of more checkpoints on Tuesday, as they moved east from Sheikh Maskin towards the town of Izraa.